While Topeka, Kansas, mayor Bill Bunten is far from a member of the dotcom generation at age 79–he has an email address, but depends on staff to use the Internet for him–one thing he does know is the value of some good public relations. When it comes to luring new investors into your town, you do what you have to do. 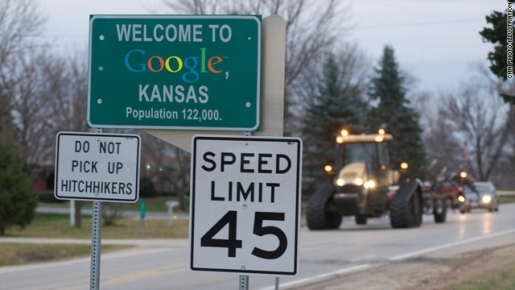 That’s why, until the end of the month, Topeka will change its name to Google, Kansas. You see, Google is launching a program called Fiber For Communities. Basically, they’ll sweep into unannounced locations and secretly replace their current Internet service with super-fast Internet access, with speeds up to 1GB at a competitive price. Cities have until March 26 to announce their interest in the project, which Google spokesbloggers say will connect anywhere from 50,000 to 500,000 people to lightning-fast broadband. Google has launched the project because they feel the US is getting too far behind the rest of the world in Internet speeds and wanted to do something about it.